We are proud to announce the release of our latest product – EndoAmp. 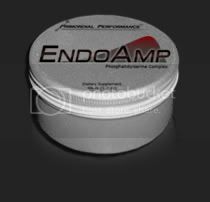 EndoAmp is a natural phospholipid complex, designed to amplify testosterone production and muscle growth by reducing the stress hormone cortisol. EndoAmp is a brown “nutty” tasting powd*er which can be taken by itself, or mixed with your favorite protein shake. The main ingredient in EndoAmp that accomplishes this is Phosphatidylserine (PS). PS is a natural phospholipid which helps reduce the stress hormone cortisol. By suppressing cortisol, EndoAmp can “amplify” testosterone production by increasing the testes sensitivity to LH and FSH stimulation. This makes EndoAmp the perfect supplement to include with other testosterone boosting supplements, such as Sustain Alpha. A month’s supply of 800mg/day of PS is only $47.99 – This makes EndoAmp one of the most affordable ways to supplement with PS compared to other capsule or pill based products. sounds interesting, i dont know much about the ingrediants, will have to do some reading. you say a months supply at 800 mg a day is 47.99, but the serving size it sais is 1600mg and there is 30 servings. is that a different bottle size, or was it a typo on one of them? PS is a good supp. Eric you know I gotta ask as I always bring this up when it comes to PS...I may PM you first. Btw for those interested all the studies in reference are posted on PP's site. I think he means 800mgs of Phosphatidylserine since thats what a lot of people were wanting. Idk about the rest of the complex and how it adds up to 1600 mgs though. his 800mg a day is just on the phosphatidylserine, as that is the most important portion of the compound. The rest of it is just a mix of other phospholipids. no to be horribly negative, but that price isnt that good... and i really do not see PS having any effects on lean mass gains. 50%? From what I know that is a very good price. And I know a little bit about sourcing products. Read the study on a decrease in DOMS...good info in there relative to our pursuit of BB'ing. first supplier i checked had it for 50 bucks/[email protected]%, with a COA... you cant compete against reliable sources by pricing things the same as them. Also 10% off using coupon code. 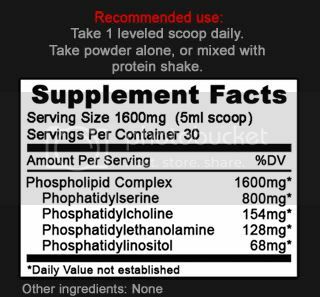 Is it posssible to get pure phosphatidylserine? From soy? I know of a company claiming to be selling it.. at a higher dose for less $. Not sure what to believe though. any soy based 50%ps powder is gonna have the same phospholipid content... or close to it atleast. i HIGHLY doubt that... show me the link? i severely doubt that stuff is 100% PS... i pulled up the companies supplier (which is a cosmetic company as far as i can tell) and the products they offered were 97% phosophlipid content @ 50% phosphatidylcholine not 97% PS. the advertising and wording they used is a little misleading. So your saying our stuff is priced well? This looks like a very good product and is well priced. Nice work! Wouldn't mind seeing someone log this on AM, I'd follow. EndoAmp is going to be a part of our Complete Testosterone Boosting stack – Sustain Alpha, Toco-8 and EndoAmp. We will be having a special package deal put together for this by the end of the week. Maybe we could get a log with some pre and post blood work with the whole stack. Is this the same stuff?. I was thinking about trying this years ago then DS came out with lean extreme, then cortisol control products seem to have plasterd the supplement industry. Yes, that is the same Phosphatidylserine. The benefit with using PS for cortisol control is that it can potentialy boost testosterone, rather than decrease testosterone like most of the available 7-oxo (7-keto) products on the market. Big fan of PS, but Bodywell's First Order is a little more of what I am looking for in a PS product. But would be interested in trying EndoAmp. Have you tried BW's FO? I tried it and didnt like it at all. There is also no way to tell how much PS/BA is in the prop blend. Not yet, but I picked up a sample mini-shaker with 3 packs which I plan on trying soon. But PS, Alpha-GPC, and Rhodiola Rosea make it sound like one heck of a supplement which I might try using post-workout. I like the rhodiola rosea, but I couldn’t see anyone justify the cost of alpha-GPC. This was a runner up for being added to the EndoAmp, but the research just isn’t available and what is available certainly isn’t promising for suggesting an ergonomic benefit for an athlete or bodybuilder. I Would Like To Know If Anyone From Australia Has Tried To Purchase Any Of These Products From This Company With Success Woul Like To Try Just Worried About Ordering And Customs ? Looks Good. I think i may just give this a try. Primordial Performance's 2011 New Years Sale!! Kickstart your PCT with Primordial Performance's Testosterone Conversion Factor-1! Primordial Performance's ArginoCarn: A dynamic product of many benefits.